Technicolor shacks and vibrant murals line the streets, a gentle breeze carrying the aroma of sizzling meats, warm pastries and dulce de leche as the group of business students make their way through La Boca neighborhood of Buenos Aires. A striking couple in traditional Argentinian garb appears, and begins to tango, serenaded by the music: a guitar, flute, and violin. Suddenly, a second couple pops up across the street, then a third. Everywhere the students turned, there was dancing. 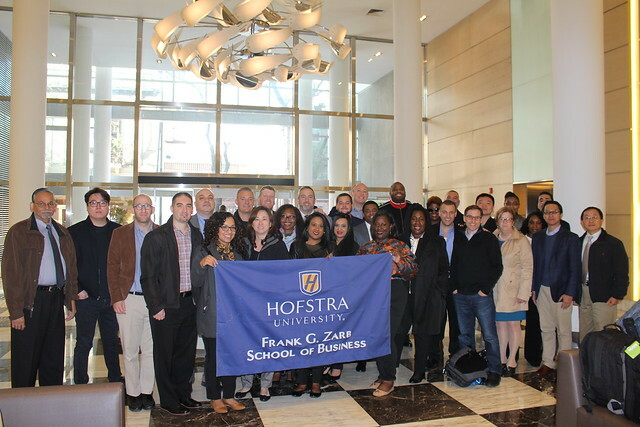 The 29 students from Hofstra’s online MBA and executive MBA programs had come to South America for a Global Practicum to learn about the continent’s emerging markets and broad industrial base. 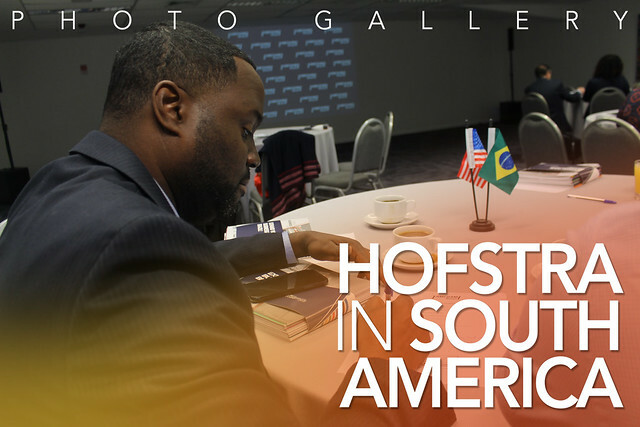 They left with a deeper understanding of Argentina and Brazil, the lessons begun in classrooms and boardrooms fortified through experience, steeped in music, movement and the magic of the streets. The first five days of the trip were spent in Buenos Aires, the capitol of Argentina. Then, the group flew to Sao Paulo, Brazil’s financial center. The diverse itinerary, ranging from business visits to cultural exploration, allowed students to better understand the relationship between the rich culture and struggling economies. Students met with officials from the American Chamber of Commerce in both countries to learn about the economic landscape in the region. They also visited the office of Cargill in Argentina, one of the world’s top agricultural producers and distributors; and had a tour of Natura Brasil, a multi-billion-dollar manufacturer and marketer of beauty products with a presence in over 70 countries. From Thailand and China to South Africa and the Middle East, the Zarb School’s Global Practicum has been taking students around the world for more than 15 years. But this was the first time that students consulted with local companies to help develop their business plans. Before the trip, students had to come up with solutions to their clients’ problems. Then, after meeting in person, the students presented their recommendations to the companies. Online MBA candidate Mindy Lee, ’19, worked with Codika, a software applications program based in Argentina that works on scheduling and workflow optimization for physicians. As director of operations for VIVO, which is part of Northwell Health, New York State’s largest health care provider, Lee was able to offer her expertise and provide relevant industry insight. Executive MBA candidate Leo Battino, ’19, also brought some industry knowledge to the table. His client was Libbra, a food service marketing consultancy in Brazil that is launching a tool to allow companies to graphically represent their data to consumers. 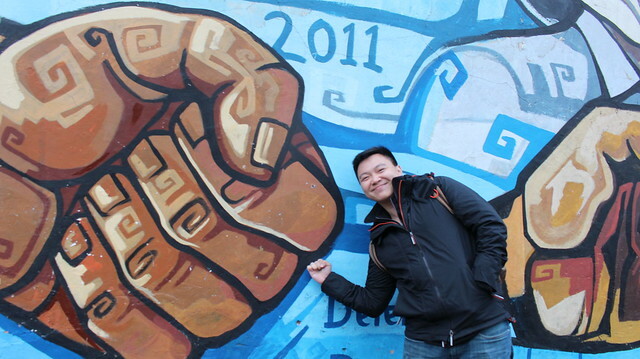 Students also had the opportunity to visit Plaza de Mayo and the Recoleta neighborhood, the hub of the aristocracy in Buenos Aires, and Batman Alley in Brazil, where they were surrounded by psychedelic graffiti. They even made time for some dance lessons. full of energy and passion from the dancers and the audience. “Rhythm is a part of the nation. Music is a part of the beat of every culture. So learning how to move certain ways strengthens your connection with the people,” said online MBA candidate and first-time Tango dancer Anthony Smalls, ’19. On one of the final days of the trip, students split into groups to visit the Brazilian Federation of Banks (Febraban) or Sírio-Libanes Hospital. Online MBA candidate and physician Devon Klein, ’19, MD, MPH, went to the hospital. The group was not without an appetite on their trip below the equator. They fully immersed themselves in the South American food culture, enjoying fresh meats, dulce de leche, and empanadas. “I never knew I could love a pastry filled with meat and cheese so much,” said online MBA candidate Mati Kerpen, ’19, who has traveled the world throughout his career as a broadcast engineer for PSSI Global Services. Despite his global resume, Kerpen said he’s never had an experience quite like the South America trip.